Directions: From Denver take 285 South to Pine Junction. Make a left (south) on Pine Valley Road (126) and follow to just before the Pine Historic District. Make a left on Crystal Lake Road (following the signs to Pine Valley Ranch) and take this to the Park's parking area. The trailhead is located next to the bathrooms at the west end of the lower parking lot. Pine Valley Ranch is a wonderful place. 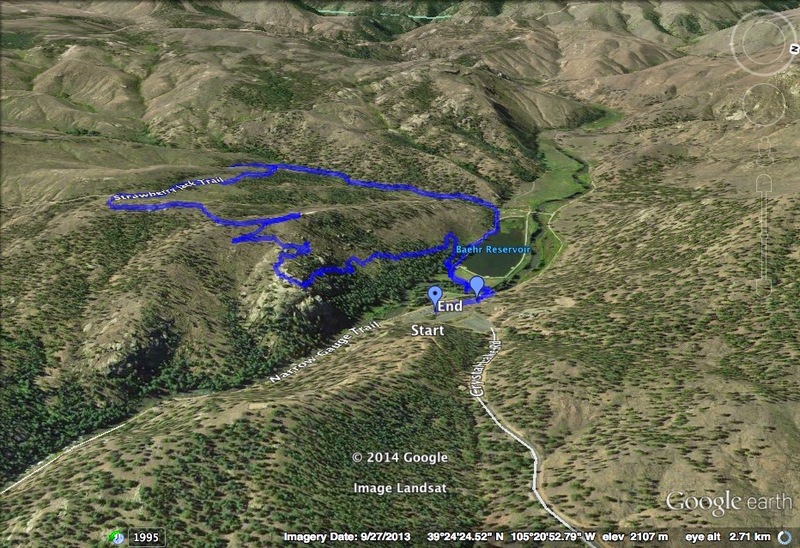 This is one of my favorite hikes in the Jefferson County Open Space System and it is one of my go-to hikes when family or friends come to visit from out of town. The hike is long enough that it feels like a "good" hike but short enough not to be overwhelming. The views from the top of the trail are fantastic and there are just the right amount of visitors not to feel too crowed. From the lower parking lot pick up the Park View Trail as is skirts around the shore of Baehr Reservoir. You'll see a trail sign and some steps leading up into the forest this is the real start of the trail. From the reservoir the trail switchbacks up the side of mountain with rocky steps and ledges and a handrail to help in a few narrow and tricky spots. Along the way there are great viewpoints looking west along the North Fork of the South Platte River. After you climb up a particularly rocky section you'll get to the main viewpoint on the trail, a series of slick rock boulders looking east to rocky peaks and down to the Platte. This area was part of the Buffalo Creek Fire and so the peaks and hills in the distance are prominent with burnt trees and newly formed undergrowth. From here the trail snakes back to the west providing another great viewpoint, this time looking west towards the Kenosha Mountains. After the viewpoints the trail descends into pine and burnt forest and leaves the open space park. The typical loop leaves the park and picks up the Strawberry Jack trail in the Pike National Forest's Buffalo Creek Recreation Area. For a longer hike description in this are click here. The Strawberry Jack trail will take you west and downhill through the recovering forest to the Buck Gulch Trail. Turn right and follow the Buck Gulch Trail down through pine and aspen to the Pine Lake Loop. Turn right again and follow this along Baehr Reservoir back to the starting point. When all is said and done, you'll hike just under 3 miles, get tremendous views and experience a varied (burnt/recovering/healthy) forest ecosystem.